Video feedback is created when a video camera is pointed at its own monitor, just like audio feedback is created when you put a microphone close to its own speaker. For more details, and to learn how to make images like these yourself, look here. One thing I must emphasize up front is that the images you'll find here were all formed inside a video feedback loop. They were not imposed from the outside in any way. They are examples of self-organized pattern formation, a natural process used by all living things to create structure. On this page, I've placed a few sample images to give you a feel for what is possible with video feedback. The main gallery, entitled The Mixer, has over 100 images. Video feedback is created in real time. The images on these pages are all snapshots of evolving patterns that sometimes change very quickly. In this case, a small spiral was rotating slowly, and I captured a few images, spaced a second or two apart. Click here or on the images above to see some more spirals of various orders. These types of spiral patterns are often seen in active media, such as in the Belousov-Zhabotinsky chemical reaction. Here, a slightly more complex figure with eight-fold symmetry pulses and decays. 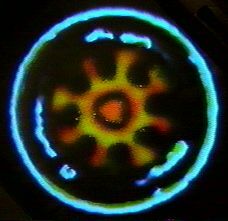 Many of the forms created by video (or other) feedback loops are unique and short-lived. One of the more common patterns in video feedback involves long, thin tendrils that weave about on the screen. 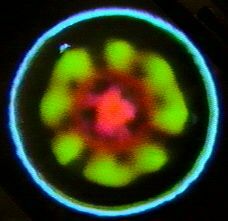 I took a snapshot of one of these "fingerprint" patterns, and removed all the parts that were not connected to the central core, shown here. Click on the image to see the original, and a few relatives. This is a timeseries from A Video Feedback Oscillator, which demonstrates how a single control (in this case, the brightness) can take a complex non-linear system through a bifurcation sequence from simple periodic oscillation to chaos. 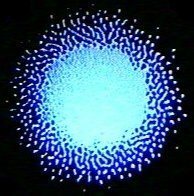 Video feedback can also be used to create fractal patterns. Like their digital cousins, they result from the repetition of a simple transformation. This is the entrance to the main gallery. 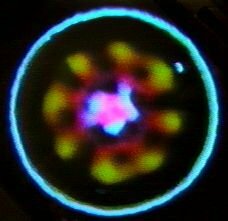 All of these images were made while I was working on my Ph.D. at the Center for Complex Systems and Brain Sciences at FAU. While I was supposed to be working on my Ph.D., that is. Be sure to check out The Ultimate Video Feedback Page, a comprehensive collection of video feedback stuff from all over the world. 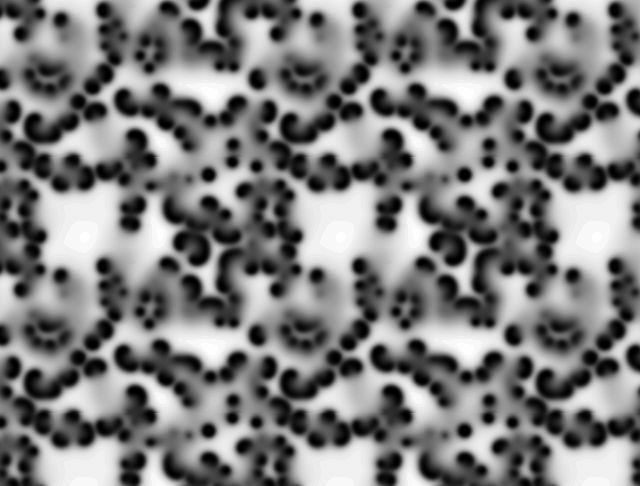 Also, here is a mathematical model called Xmorphia, which is a reaction-diffusion system that generates patterns somewhat similar to those seen here (but much more slowly!). Finally I'd like to thank Dr. Richard Voss, who bought and let me use all of the equipment, and Dr. Heinz-Otto Peitgen, who showed me how.